For many businesses today, generally only two things are certain: greater uncertainty and an accelerated pace of change. Globalization increases the scope of competition. Digitization hastens the pace of business. Customers are more empowered than ever before. A two-speed economy—rapid growth in emerging markets, slowing growth in developed markets—means that companies must execute in an increasingly complex world. In this environment, the ability to develop and implement new strategic initiatives and change gears rapidly is becoming a key differentiator. Virtually all senior executives know this, and they devote significant attention and focus to defining and developing major strategic initiatives. 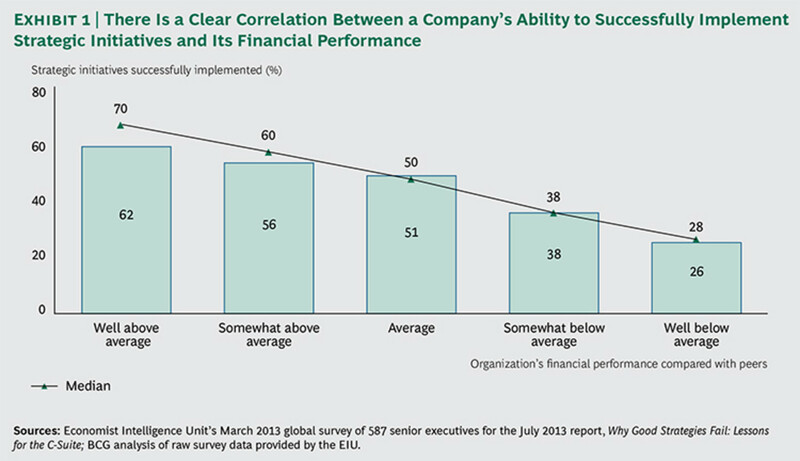 Still, many companies struggle to successfully implement those initiatives. The difficulty is widely attributed to shortcomings in leadership, but, in reality, it is largely associated with ineffective engagement. Too many senior executives have trouble getting the information they need—when they need it—to make the frequently necessary adjustments and course corrections that in today’s business environment are critical for ensuring that large strategic initiatives will deliver their target impact. Research by the Project Management Institute (PMI), the Economist Intelligence Unit (EIU), and Forrester Consulting over the past year has identified several critical issues for successfully delivering bold change that materially impacts the role that the PMO can play. 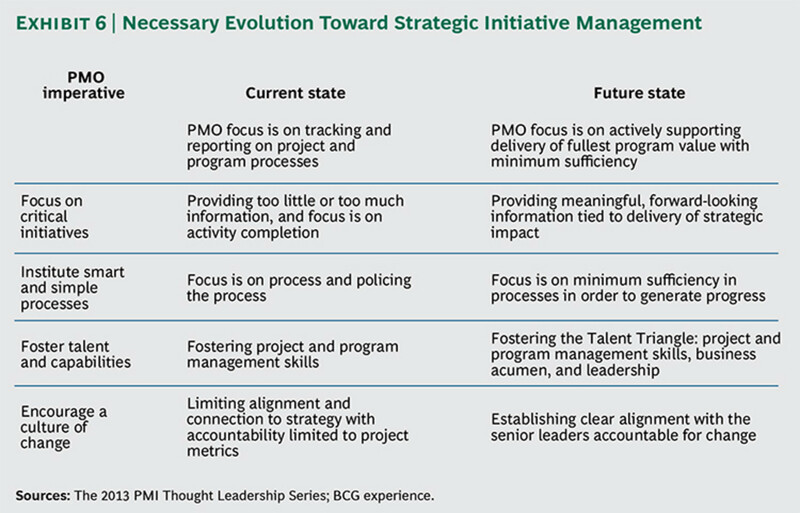 Building on that research, The Boston Consulting Group has identified the following four imperatives for improving the odds of successfully delivering strategic initiative implementation efforts—imperatives in which the PMO can serve a critical support function. Focus on Critical Initiatives. Provide senior leaders with true operational insight through meaningful milestones and objectives for critical strategic initiatives. 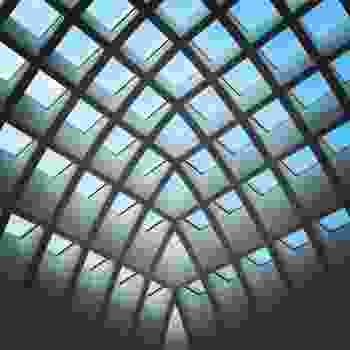 Such focus promotes clarity and course correction around emerging issues and the fullest possible realization of impact. Institute Smart and Simple Processes. Establish program-level routines that track these milestones and objectives, communicate progress, and help identify issues early without adding undue burdens or usurping the businesses and functions executing the work. Foster Talent and Capabilities. Develop and nurture the right technical, strategic and business-management, and leadership skills and capabilities within the organization. Encourage a Culture of Change. Actively build organization-wide support for—and commitment to—strategic initiative implementation and change management as a real competitive differentiator. Together, these four imperatives provide C-suite executives and the extended leadership team with the confidence and forward-looking course-corrective ability necessary for the organization to execute effectively and develop the skills and confidence to take on even more ambitious change. The companies that can develop these capabilities and advance their PMOs to a more strategic orientation will significantly improve their ability to implement strategic initiatives, potentially establishing a basis for real competitive advantage. The Project Management Institute (PMI) has issued a series of research articles and other publications aimed at elevating discussion of the role of program or project management offices (PMOs) in enabling successful implementation of strategic initiatives. 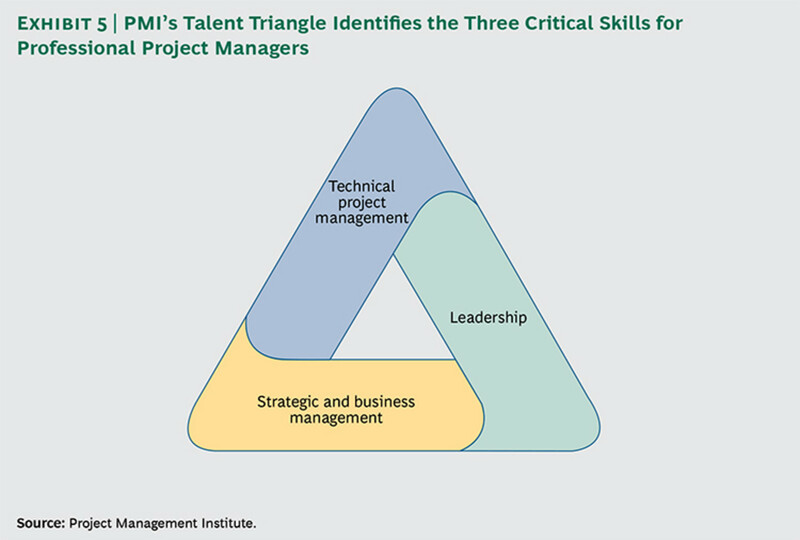 In the aggregate, PMI’s Thought Leadership Series has identified several program- and project-management concerns that confront many companies and has described ways that PMOs can help address these concerns. 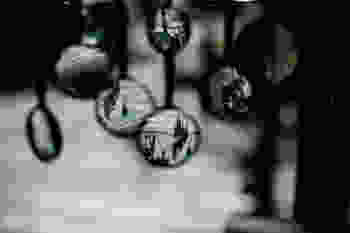 In Why Good Strategies Fail: Lessons for the C-Suite, the EIU looks at senior-level support for strategic initiatives and the reasons for disconnects between strategy formulation and implementation. PMI’s Pulse of the Profession: PMO Frameworks profiles the most common types of PMOs prevalent in organizations and highlights key practices of each. In Strategic PMOs Play a Vital Role in Driving Business Outcomes, Forrester Consulting identifies success factors in advancing project and program management to a more strategic role and shows how those efforts generate value for organizations. The consistent message coming out of this thought-leadership series is that PMOs must enhance their capabilities and processes if they are to effectively support senior business leaders and serve as real enablers of strategic change in an organization. Just one-third of PMO leaders feel that their PMO has realized its full potential for contributing business value to the organization. In the past, many PMOs have, by necessity, adopted a tactical approach—still the most common model at many organizations—that was well suited to their primary objective of supporting the delivery of departmental projects and programs.2 However, this approach is no longer sufficient. Company leaders understand what’s at stake. According to research conducted among 587 C-suite and senior executives by the EIU for this series, 88 percent of respondents said that executing strategic initiatives successfully will be “essential” or “very important” in ensuring that their companies remain competitive over the next three years. The same study found that engagement by the executive team can make or break an implementation effort: respondents identified leadership buy-in and support as the number-one factor leading to the success of strategic initiatives. Today’s initiatives, with increased risks and greater interdependencies, must be implemented more frequently—in many cases, with incomplete information. 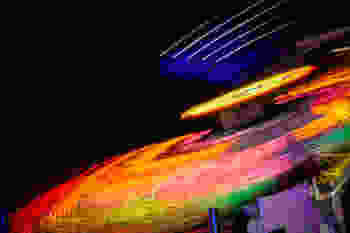 Failures are increasingly public: companies are subject to rigorous external and internal scrutiny of major strategy-implementation efforts and how they are proceeding. And the inability to deliver bold strategic initiatives is costing increasing numbers of senior leaders their jobs. All of this dictates a clear need for the highly effective involvement of senior executives in regular progress assessment and course corrections. And, in fact, this could point to the need for a formalized executive-level approach to strategy implementation management as an essential complement to strategy development. The central issue comes down to the way that information regarding these strategic initiatives gets structured and communicated to the C-suite and the extended leadership team—not just the C-suite’s reports but also their reports in the business and functions— as well as how company leaders engage with that information. Executive teams are extremely busy, with myriad demands for their time and attention. They generally sit several layers away from where the initiatives are executed, and in many instances, they are highly concerned about whether people further down the organization chart can deliver on their mandate. All too often, senior leaders don’t hear about problems until it’s either too late or too expensive to fix them. Despite the importance of these factors, the interactions between senior leaders and PMOs are often not sufficient for companies to meet the challenge. 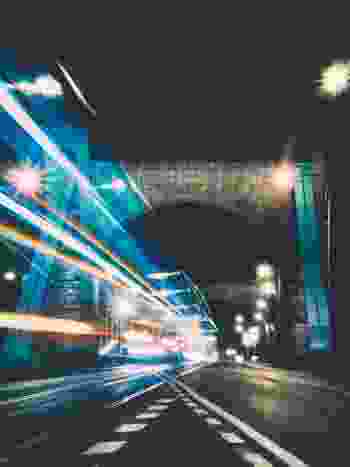 Forrester Consulting data show that PMOs that have bridged this gap are able to add real value in supporting the delivery of strategic initiatives. Furthermore, PMOs that succeed in helping underpin business growth report to a range of senior executives—from senior vice presidents to the C-suite level—and the majority have a highly visible champion in the senior executive suite. Yet this is a new role for many PMOs, and it involves an expanded mandate for facilitating strategic change. Although PMO leaders have made notable strides over the past decade, there is clearly more work to do—and more for organizations to do if they are to capture the real value-added opportunities from their PMOs. Where to start? BCG’s experience and PMI’s extensive research indicate that companies that succeed in implementing strategic efforts focus on several capabilities, behaviors, and processes that are needed to facilitate senior engagement and improve the implementation of strategic initiatives. Whether strategic or tactical, these imperatives collectively make up the means for capturing and structuring the right information associated with strategic initiatives and communicating it in the right way, enhancing engagement with senior leaders and potetially improving implementation success overall. PMOs need an enhanced process for helping the organization align, define, track, and communicate meaningful milestones and objectives, specifically in the context of developing roadmaps for strategic initiatives. Roadmaps must identify the set of critical milestones that provide senior leadership with a basis for operational insight into what the initiative is about, what the critical known risks and interdependencies are, and how the initiative is progressing, through forward-looking lead indicators. How do these roadmaps do this? They focus solely on a small number of critical milestones (in BCG’s experience, there are typically 10 to 25 per roadmap), along with explicit time frames, financial and operational metrics that are linked with overall objectives, and clear accountabilities. The milestones set a cadence for the entire change program, breaking it into more manageable pieces that, for everyone involved, become much more attainable. This requires establishing clear metrics and KPIs that must be as quantifiable and specific as possible. In assisting with the development of the roadmap, PMOs support the business in helping identify and describe critical risks, assumptions, and interdependencies that are linked to specific economic or operational objectives and connecting them to milestones with explicit trigger dates and metrics for their testing and assessment. The ability to provide regular updates from roadmap owners allows for a means by which senior executives can readily understand progress and any emerging problems. This not only ensures that the initiative is built around the right actions and measures—that is, that the organization is doing the right things—but also that it can support senior executives in being effective in their leadership roles during the implementation effort. To ensure that roadmaps are sufficiently detailed and robust, many high-performing PMOs apply some form of a “rigor test” before an initiative can be launched. 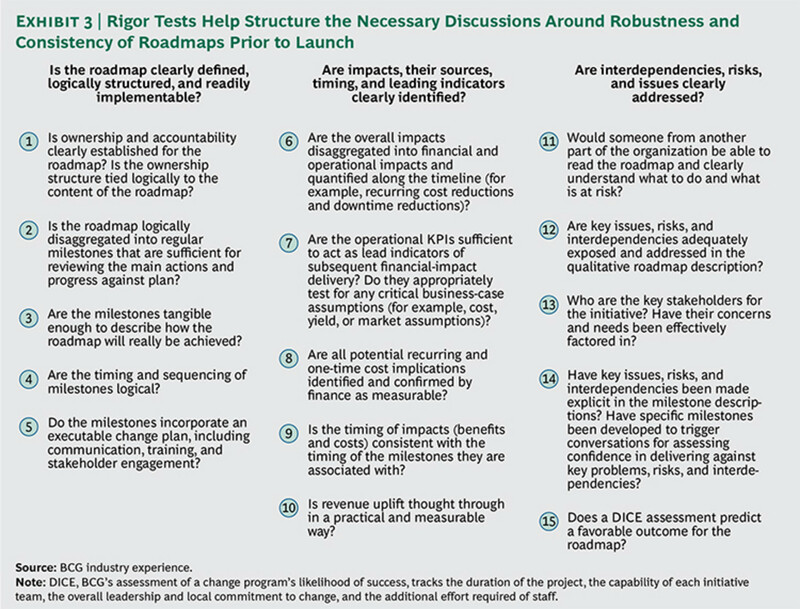 A rigor test should be designed to determine whether the roadmap underpinning an initiative is sufficiently clear and whether it provides links to overall impact. Furthermore, the test should identify whether the set of milestones and objectives in the roadmap provides a robust basis for testing for known risks and interdependencies. (See Exhibit 3.) It also facilitates consistency of quality across projects and programs within a portfolio. A rigor test discussion ensures that the roadmap contains the necessary and right information for senior leaders to be able to make course corrections when needed. Implemented correctly, this rigorous approach to establishing milestones and objectives helps establish a virtuous cycle. Information delivered at the right level of operational detail—and in nontechnical jargon—leads to greater understanding among senior executives. Understanding, in turn, leads to greater support and more effective course corrections that mitigate problems, leading to improved interim results and greater buy-in by all participants and, thus, enabling greater execution success overall. The next imperative outlines how this works in practice. When the right metrics and milestones are in place, it’s time to establish a manageable routine to record and gauge progress in a meaningful way as the initiatives get rolled out. The risk that the company may be collecting and monitoring too much information is all too real and can put an undue burden on the staff executing the initiatives. For example, once large strategic initiatives are underway there is a tendency in some organizations to capture as much data as possible about the project. Given the uncertainty inherent in major change efforts, this tendency is understandable. It can be reassuring simply to log everything—reducing the odds that the organization will miss some critical metric. Instead, PMOs must tailor their approaches to the needs of the organization. Strategically aligned PMOs eliminate onerous routines, unnecessary meetings, and excessively long reports. Rather, they apply the level of orchestration that is required to both support the business in strategy execution and help ensure progress and spot emerging problems without creating new bureaucracy or weakening ownership of the initiatives. With the initiative roadmaps having been rigor-tested, the PMO well positioned, its role clearly understood, and the right processes established for gauging progress against upcoming milestones and objectives, strategically aligned PMOs provide the means for the business managers tasked with delivery to provide senior executives the information they need—and only that information—with enough time to make course corrections and ensure that the initiative gets delivered in terms of both impact and timing. 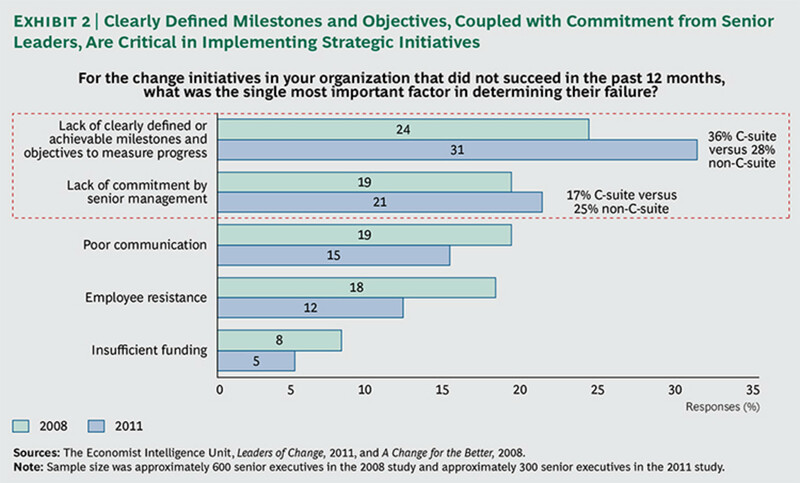 As PMI’s research shows, high-performing PMOs tailor communications to different stakeholder groups.10 This means limiting the information communicated to executives to an overall status of the program (that is, current achievement against targets) and any emerging issues that require executives to intervene with the range of tools at their disposal—for example, removing roadblocks, fast-tracking decisions, prioritizing projects, and reallocating resources. Another critical aspect of tracking progress is the importance of providing a current portfolio view for senior leaders. For example, Exhibit 4 shows BCG’s analysis of approximately 2,000 initiative roadmaps, with US$4 billion in impact-bearing milestones. Of course, not every individual roadmap for every initiative can be expected to be fully delivered. Analysis at the individual roadmap level shows that 35 percent of impact-bearing milestones exceeded plan, 45 percent were within plan, and 20 percent fell short. Overall, this portfolio of initiatives was successfully delivered, achieving more than 110 percent of the targeted economic value. A portfolio view—with a PMO actively supporting senior-leadership discussion—ensures that organizations adopt an enterprise-wide perspective. 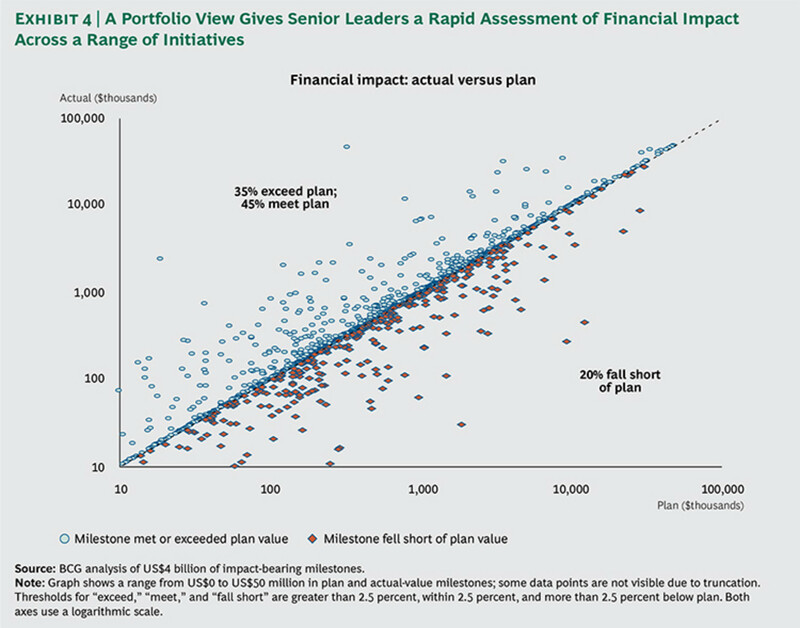 This generates the necessary forward-looking clarity on how the overall program is proceeding against planned impacts, spotlighting areas that require additional attention and enabling organizations to overdeliver against targets despite inevitable and initially unforeseen implementation shortfalls in individual roadmaps. A leading bank recently underwent a major transformation to realign its businesses in the face of structural changes brought about by the global financial crisis. That program consisted of almost 1,000 separately managed but interdependent projects, which included changes in sales and service practices in the branches and call centers, as well as corresponding enhancements to the underlying technology and operational infrastructure. The senior executive in charge faced the daunting challenge of identifying emerging risks among all these projects and deciding whether interventions were needed to land the whole transformation successfully. On the one hand, it was neither practical nor feasible for this senior executive to read the hundreds of individual reports that were being used in executing the projects. On the other hand, the organization was already stretched to the breaking point by trying to run the bank while changing it. So the responsible PMO needed to be aware of the possible impact of introducing a new reporting requirement on top of what existed. In the end, the PMO helped create a practical minimum-sufficiency solution: a rigor-tested roadmap with approximately 15 milestones, KPIs, and objectives for each project that had to be monitored at the executive level; monthly reporting; a focus on changes and exceptions only; and action-oriented PMO-facilitated meetings focused only on those issues that required the senior executive’s decision or intervention. There is a clear sequence to this process. On a forward-looking basis, the business provides regular updates (typically biweekly or monthly) on progress. The rigor-tested roadmaps give the executive team (supported by the PMO) the option to readily engage on any of the milestones or any objectives that are at risk. And because these concerns are raised early enough, the leadership team usually has time to make corrections before problems cascade and compound. Through these four clearly linked imperatives, PMOs can play a powerful role in helping facilitate the successful implementation of strategic initiatives over time. The essential objective of the strategically aligned PMO is to actively support and partner with senior leaders to ensure that major strategic initiatives deliver full value while minimally distracting or disrupting the ongoing business. 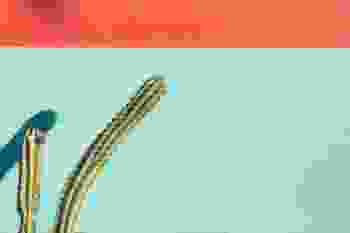 To that end, the PMO supports the business by prioritizing issues, identifying problems as they emerge, helping identify and potentially support complex interdependencies, and helping provide a highly effective means for communicating the right information—including progress toward targets—at the right time. Most critically, in helping secure engagement with and commitment from senior leaders, the PMO ensures that they get the information they need: the leaders know what’s going on and are positioned to make decisions on the basis of real operational insight, ensuring the successful delivery of strategic initiatives. (See Exhibit 6.) Of course, the PMO does not actually execute the change; that responsibility resides with the businesses and functions. Instead, the PMO plays an enabling role, serving to provide enhanced interactions with the leadership team. When designed and supported effectively, strategic PMOs can constitute a true competitive differentiator in delivering bold change. Forrester reported that “by investing in a strategically aligned PMO, every company saw distinct benefits; two-thirds of the companies interviewed saw improved performance in less than six months and realized the value of investing in the PMO within two years.”12 Moreover, strategically aligned PMOs can help build critical capabilities, not only within the PMO itself but also through their engagement with senior leaders and more broadly within their organization. To better support the implementation of strategic initiatives and improve strategic alignment, PMOs need to evolve along the four imperatives. In a business environment characterized by persistent disruptions and escalating complexity, strategic change happens with increasing frequency, and companies must become more agile if they are to remain competitive. This requires that PMOs take on a more strategic role than they have in the past, developing the capabilities, processes, and tools and helping foster the behaviors needed to successfully implement strategic initiatives. High-performing PMOs help enable the right level of engagement with senior leaders—which is critical for strategic implementation—through meaningful milestones and objectives, smart and simple routines that track progress without adding new burdens, the right talent, and an organization that supports change. Together, these form an interlocked set of capabilities that reinforce each other, leading to stronger performance. Building up these capabilities is not easy, but doing so is crucial.